Reading regular feeds is the most important part of a blogger`s life. There are many feed readers available online. You like to read your feed on desktop but what if you not home to check your desktop. For this, we have mobiles, tablets to red feeds. Today we discuss about top 5 feed readers for iPad. iPad is an awesome gadget. It make reading feeds fun and interesting. There are lots of apps available for iPad to make reading interesting. Feed readers don`t let you feel bored. So today I show you 5 Feed Readers for iPad that will bring interest in reading feeds. These apps also have bookmarking integration so you can mark to read later. Flipboard is a best looking magazine themed feed reader for iPad. It not only allow you to read Google feeds but also you can read Twitter, Instagram, Facebook and many more feeds. Flipboards magazine style makes reading better. This app available for free on App Store. This is also similar to Flipboard. 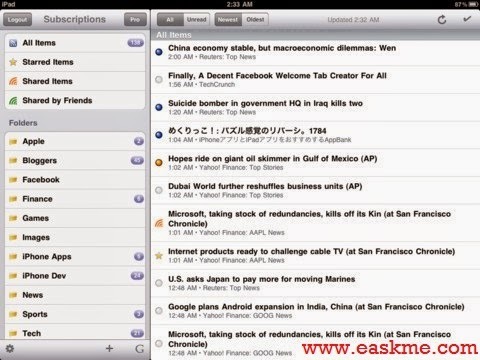 Pulse News Reader for iPad has all features that we need in a RSS reader. It use darker themes to make text bright and easy to read. It do not allow you to sync Google reader feeds but you can import your own feeds. its themes are attractive and its also free both for iPhone and iPad. Zite fo iPad is totally personalized. if you are a tech reader than you see relevant content on it. This all based upon your reading habits. It also allow you to sync it with twiiter or Google reader and it start reading your habits. This is a free app and compatible with other iOs devices also. If you want a simple style feed reader than Reeder is for you. It works faster load faster and synch with Google Feeds also. But Reader need to be purchased to use and its cost is about $4.99. It is simplest and fastest feed reader. But it do not have any user interface. It looks like Google reader. It allow you to manage feeds, share news, add comments and so more things to do. These are the 5 best feed readers for iPad. It is recommended to install two or three of these. Do share your experience with feed readers? To get updates in your email subscribe our feed.